The new GOP tax reform bill could deal another blow to cash-strapped Puerto Rico as it recovers from the devastating impact of Hurricane Maria. The final draft calls for a 12.5% tax on any income generated from patents and licenses held by foreign companies outside the United States. Under U.S. tax codes, companies in Puerto Rico are treated as foreign corporations, even if their parent organization is located in the mainland United States and they employ U.S. citizens. Under previous law, companies in Puerto Rico paid no federal tax on patents or licenses. Companies may apply for things like patents at the federal level, but the taxes they pay are based on where a company or its subsidiary are physically located. Puerto Rican leaders say the new tax takes away one of the few incentives the island has left to attract and retain companies that might consider going to other low-tax havens like Ireland. "The tax reform bill is a serious setback," Puerto Rico Govenor Ricardo Rosselló wrote in a letter to Congress Monday. It could have been much worse, experts say. Republicans were initially pushing for a 20% tax that essentially would have been applied to goods made in Puerto Rico and sent to the mainland. That provision got thrown out. Congress officially passed the tax reform bill Wednesday morning, and House Ways and Means Committee Chairman Kevin Brady said other measures are in the works that reflect Republicans' support for Puerto Rico. "We are just absolutely committed to helping that island rebuild," Brady told reporters Tuesday. A committee spokesperson declined to comment when asked if the bill might be amended to exempt Puerto Rico from the 12.5% tax. Puerto Rico is in much worse economic shape than any U.S. state. Its unemployment rate of 10.6% is more than double the national average of 4.1%. The island has been in an 11-year recession after other corporate tax breaks expired in 2006. Puerto Rico has only recovered 65% of its capacity to generate power since Maria hit in mid-September. Many fear that the damage caused by the storm could exacerbate an ongoing exodus of Puerto Ricans to the mainland. The Center for Puerto Rican Studies at Hunter College in New York estimates that as many as 213,000 Puerto Ricans will leave the island because of the hurricane. Puerto Rico has about 3.4 million residents. Pharmaceutical businesses operating in Puerto Rico employed about 90,000 workers on the island before the storm hit. Experts say those firms will have to pay this tax if they have licenses or patents based in Puerto Rico. Microsoft (MSFT) also has a sizable operation on the island, but the company declined to say if any patents are held by their subsidiary in Puerto Rico. With the tax going from zero to 12.5%, experts say Puerto Rico will lose a key recruiting pitch for companies to come to the battered island. Multinationals would face the same tax whether they operate in Puerto Rico or Ireland. Except that other countries don't have the headache of recovering from a hurricane. "It takes away any advantages that Puerto Rico may have had," compared to other foreign tax jurisdictions, says Glen Manna, a director of equity research at KBW, a private equity firm, who follows Puerto Rico. "That's the decision that companies are going to have to consider in the long term -- whether it's worth it to stay or whether it's worth it to leave." Another bill in the works, separate from the tax overhaul, should help Puerto Rico. The legislation would create "economic opportunity zones" in Puerto Rico's low-income areas, which would offer tax breaks to companies that create jobs there, among other incentives. The zones aren't guaranteed yet, but text of a bill was presented Monday. In October, Congress also approved $36.5 billion in disaster relief aid for all U.S. areas impacted by storms late last summer. It's unclear how much of that will be used to rebuild Puerto Rico. Some experts say the 12.5% tax won't trigger a corporate exodus off the island. They argue that it won't make sense for companies to leave if they face the same tax in another country. And if firms move their operation to the mainland, they'll have to pay the new corporate rate of 21%. "This tax legislation is not intended to hurt the island," says Cate Long, co-founder of the Puerto Rico Clearinghouse, a research firm that focuses on the island's debt crisis. 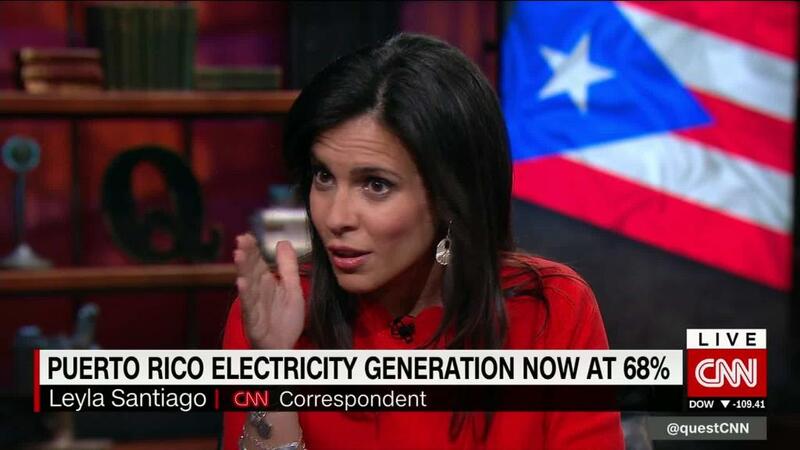 "It's still cheaper on a tax basis to operate offshore," in Puerto Rico.